- At Ypres the French line near the Yser Canal has been reinforced by elements of 152nd and 153rd Divisions, and a French counterattack against the German bridgeheads over the Yser Canal is able to retake the village of Het Sas, though the Germans remain in control of the locks. To the east a major British counterattack by the Lahore Division and the Northumberland Brigade is launched at St. Julien, but the infantry quickly run into a hail of German rifle and artillery fire. The British take heavy losses - the Northumberland Brigade alone suffers almost two thousand casualties - and are able to make no progress. There is also heavy fighting near Grafenstafel, while German attacks are able to make incremental gains near Broodseinde. The line at Ypres at midnight, April 26th, 1915. - For the past several months, squadrons of the British Royal Flying Corps undertaken increasingly frequent bombing attacks on German railways and supply depots, though not without losses. Today Lieutenant W. B. Rhodes-Moorhouse, the RFC's first Victoria Cross winner, attacks the railway station at Courtrai from 300 feet with a 100-pound bomb. Flying at such low altitude left him vulnerable to ground fire, and he is severely wounded. He manages to fly the thirty-five miles back to his aerodrome and insists on reporting the results of his mission to his CO before receiving medical attention. He will die tomorrow. - Despite every attempt at secrecy, the German buildup near Gorlice and Tarnow has simply been too substantial to hide completely. Further, the local population in the region is strongly pro-Russian; indeed, Colonel Seeckt, Chief of Staff of the German 11th Army, has wanted to deport the entire population to prevent news reaching the Russians. 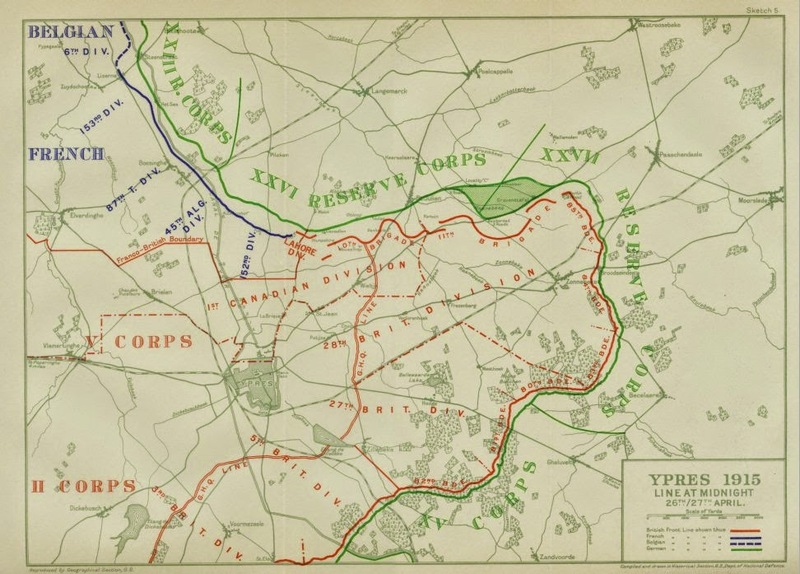 Nevertheless, the chief of staff of the Russian 3rd Army reports to South-West Front today that indications are that German forces intend to break through east of Krakow, or exactly where they intend to attack. - At 3pm this afternoon, the ambassadors of France, Russia and Italy meet British Foreign Secretary Sir Edward Grey at the Foreign Office in London, where they sign the treaty that pledges Italy to join the war on the side of the Entente. Territorially, the Italian government has achieved its aims - in exchange for entering the war within one month, Italy is to receive the Trentino and South Tyrol up to the Brenner Pass, the city of Trieste and the surrounding region, including all of Istria, northern Dalmatia, and a number of islands off the coast, as well the Albanian city of Valona. Further, the rest of the Dalmatian coast, though it is to be awarded to Serbia, is to be militarily neutralized, leaving Italy the dominant power in the Adriatic. At the ceremony, the Russian ambassador is particularly somber, as he recognizes that the treaty is a defeat for Slavic interests in the Balkans, and thus by extension a blow to Russian prestige. However, both Britain and France have stated in secret notes to the Russian government that Italy's entrance into the war does not effect their pledge of the Straits to Russia, and this, from the Russian perspective, is the more important war aim. Having reaching the diplomatic agreement, the Italian government is now faced with ensuring that parliamentary and public opinion will support the decision for war. This will be no easy task - former Prime Minister Giovanni Giolitti supports neutrality, and reports received today by current Prime Minister Antonio Salandra from fifty prefects indicate that a solid majority of the Italian public, especially in the south, backs continued neutrality. 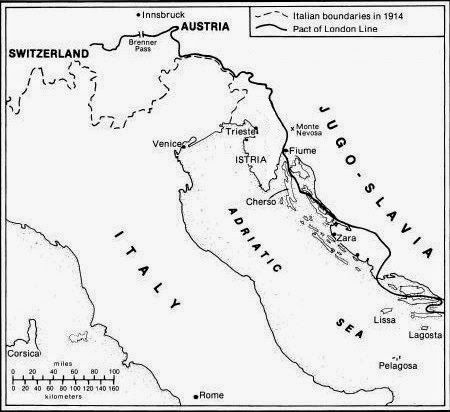 The territories of Austria-Hungary promised to Italy in the London Treaty. - At Gallipoli the ANZACs are able to turn back a heavy Ottoman counterattack, with heavy naval gunfire decimating enemy infantry advancing down the face of Battleship Hill. Otherwise, however, the ANZACs are unable to expand their narrow beachhead, and they take their commander's words to heart and dig trenches into the rough terrain. To the south, the landing at Y beach has come to grief; advancing inland, they are taken in flank and fall back to the shore. The decision is taken to evacuate Y beach, which is successful under the covering fire of the pre-dreadnoughts offshore. However, the failure to advance rapidly at Y beach yesterday had thrown away a golden opportunity to strike behind the Ottoman defences holding the British at the tip of Cape Helles, and the evacuation allows the Ottomans to concentrate against the remaining beaches. Furthest south at V beach, the news is somewhat better; after a terrible day of fighting, the Dublin and Munster Fusiliers are able to seize the Ottoman trenches at 2pm and capture Sedd el Bahr and Hill 141 to the north. The British infantry, however, are exhausted, and General Aylmer Hunter-Weston, commander of the British 29th Division, orders them to entrench against a feared Ottoman counterattack. In practice, the halt gives the Ottomans time to bring up additional reinforcements. As for the Asiatic shore, at 740am General Hamilton instructs General Albert d'Amade, commander of the French forces assigned to the Gallipoli invasion, to send those of his units not committed to the diversionary landing at Kum Kale to land at X Beach on Cape Helles. D'Amade, who had hoped that the Kum Kale operation might be expanded, now realizes that it has accomplished all it possibly (i.e. very little), and at 1130 requests that the French force on the Asiatic show be withdrawn, to which Hamilton agrees.